I actually used left over apple pie for the filling, including crust an all. I think it turned even better than the original recipe because the apple pie offers both delicious traditional fall flavors as well as added texture and crunch. Do I need to say anything else sweet friends!! Besides, it is easy to recreate and turn out incredible. And I am all about food presentation. The taste was so good that I couldn't resist eating one of the jars I was staging to photograph. 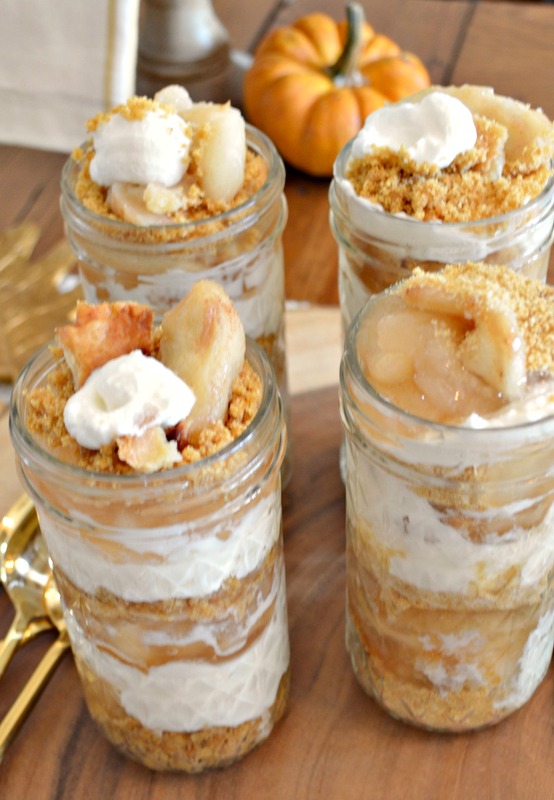 So if you are entertaining this fall or are in charge of bringing dessert to a party, then you need to bring these delicious jars of goodness with you. Your friends and family will thank you and will think you are a total rock star!!! 1) In a large bowl, beat cream cheese, sugar and vanilla extract. Once combined, fold in cool whip. Scoop into a piping back or ziplock bag with a corner cut off, to make layering easier. 2) Break apple pie into small pieces to make layering easier. 3) Combine crushed graham crackers and butter. Mix until it is the consistency of wet sand. 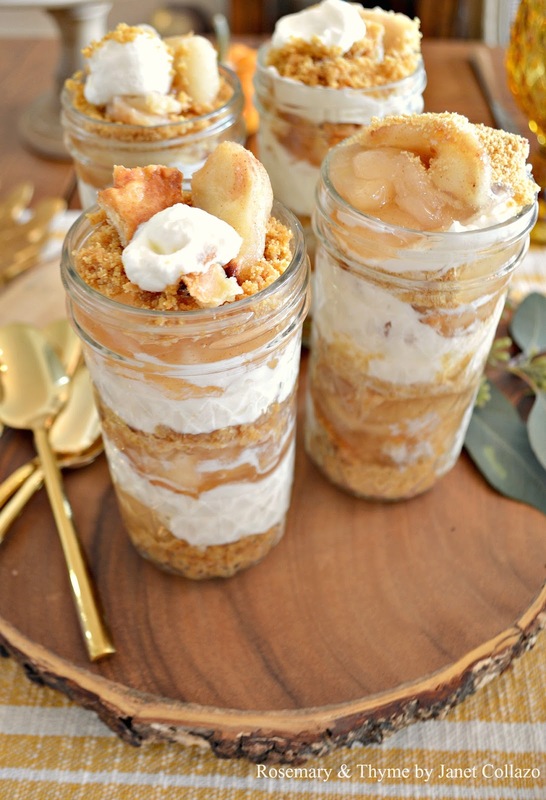 4) In a mason jar (or any any glass jar/cup) build your cheesecake: 1 layer graham cracker crust, 1 layer cheesecake mixture, 1 layer apple pie filling. Continue this pattern until you reach the top. Cover the top with a dash of graham crackers and apple pie filling and enjoy. Thank you for visiting me. I hope you give this yummy dessert a try. 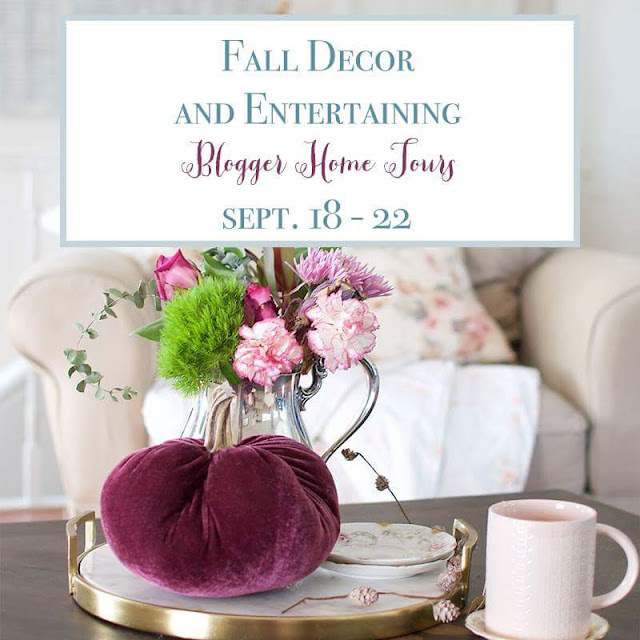 I will be joining a group of over 25 bloggers for a Fall Home and Entertaining Tour beginning tomorrow. My turn will be on Wednesday. I hope you can join us. That looks delicious! Pinning this. Janet, beautiful presentation and what a lovely dessert. Using apple pie is a creative twist to the recipe! Holy cow - this looks perfect, and perfectly easy. Thank you - pinned! This look so good and yummy Janet. Thanks for sharing this at Cooking and Crafting with J&J. Enjoy the week. This dessert looks so good and is perfect to serve in the fall. These look delicious and pretty. So perfect for fall for a crowd. Pinning. 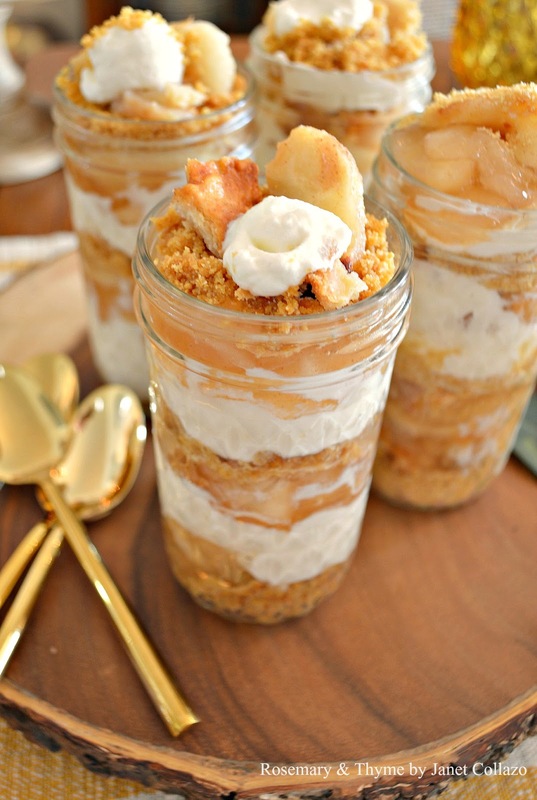 Well, I love quick and easy and who doesn't love apple pie and cheesecake!! Pinned this to make later. Thank you for sharing this yummy recipe at Create, Bake, Grow & Gather this week. I'm excited to feature it at tonight's party Janet.